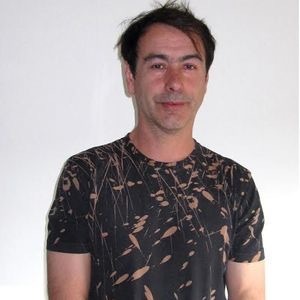 Rolo McGinty is frontman with the wonderful Woodentops and has making brilliant music since the early 1980s. We invited him along one more time to write about one of his favourite albums. There were a few low price records out there when I was just getting beyond T.Rex, Black Sabbath and Deep Purple. Roxy Music’s ‘Virginia Plain’ was a marvel. I was stuck between my fathers jazz and crooner stock and my own taste which was growing fast. Pocket money was for LPs, 45s. Therefore, any interesting looking record that didn’t use up the meagre budget was going to make it home. Relics by Pink Floyd was one of those – still an amazing collection and way into UK jamming. Camembert Electrique another full of ideas Virgin cheapy, the Virgin Sampler a double LP with White Noise and Captain Beefheart, again one pound for two LPs. 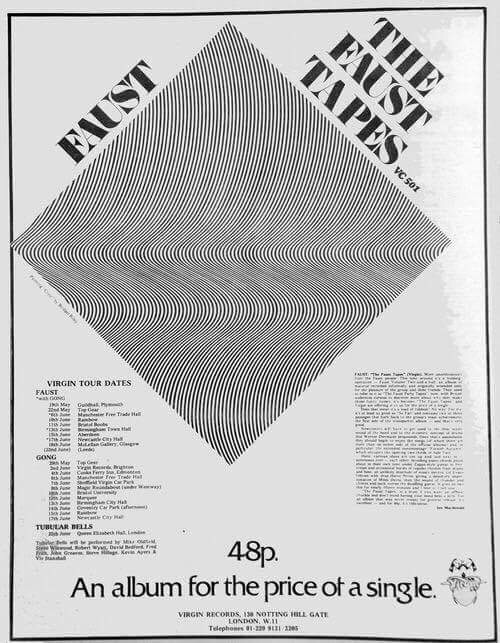 The Faust Tapes was just under 50p, had a dazzling modern art cover by Bridgit Riley – I had no idea who she was – and hours worth of reading on the back, possibly with a magnifying glass. I know now that the collection was off cuts, bits and bobs left over from other projects and small experimental segments, which is exactly what I loved about it instantly. It is packed with extremes. Circular saws, bizarre voices, different languages, irresponsibility in music, then again some beautiful musical moments, lots of tape slowing , stereo malarky , echo, pianos and sax, in and out of time drums and effects that fall into beat, just because they are there. Pioneering production for the time, integrating some of the naive and memorable songs with the atmospheric, all brutally edited into one another. Put it on and leave it on! Track One is a good pointer to the journey ahead, piano slowed right down, chopping into a mad loop of voice drums and effects that is only there for a short time before you get the first ‘song’. This opens out into a haunting piano and primitive synth sound which almost sounds like a Pink Floyd Rick Wright composition with an almost Isley Brothers’ lead guitar sitting back in the mix, Swiftly you are into the mad. What is apparently a vocal exercise takes you to some kind of Sadhu mayhem, bang from there to proto-punk, almost Pere Ubu sounding, vocals distorted and repeating with a monologue over the top, disconnected aggressive sounds blended in. Then a brace of fake endings! Back into the song it goes. More sax, this time X-Ray Spex comes to mind. Its over and you find yourself in what it sounds like when somebody’s mobile goes off in their pocket and you can hear them going upstairs. Soon we are into the funky which sounds quite Pop Group 78-79, Bristol sound. With the chainsaw super loud in the mix. It doesn’t last long before we are back into the strange. Reversed slowed tapes almost Bela Bartok, vocals through the echo annoying and funny and speed altered like a nightmare in a monastery. The machines come back, drums ominously rolling away and it doesn’t sound a million miles away from the kind of thing you might hear in Cafe Otto nowadays. The Squeaky Bonk army. Thing is if you were brought up on this album, much experimental electronic music is not as impressive as the grinning nodding artists think it is. You heard it here first. Like now we are in a disconnected singular handclap to the left of fragile silence. Not for long. The saxophones are now sounding like a wolf pack calling across the ravine under the moon. With a deep double bass giving the piece a large dimension, sub bass! Again a good friend with no musical talent and a few beans bought herself a Selmer 6 gorgeous sax, to learn on!! The man in the shop didn’t want to sell it to her. He knew it would be returning soon. It did too. For a few months though the owner wore it most of the day, repeatedly playing the only two notes (plus accidental harmonics) she ever got out of it. A very classy Dexys Midnight Runners sax player and mutual friend tried to teach her a bit, but most of the time would be giving me that ‘ no hope!’ look that is to be inner giggle only. The request came, “could you record me?” I was waiting for it ha ha! So I got my 8 track ready. Yep. the same two mournful notes went onto tape. I had a brainwave. I asked her to just keep going to overdub and overdub and overdub and track and track till we had something, a wall of sax. I had changed tape speeds, all of that, reversed the tape, all of it. Again I had forgotten about Faust but I was thinking, something about this reminds me of…. couldn’t think. The sax went back to the shop. Years after I was looking for ideas for something, I found this cacophony of saxes. This time though, i didn’t think oh i know what that is, I thought it sounded like traffic congestion in New York. Slammed some actual car and lorry horns in and there it was. I also thought “ah! sounds like Faust.” This must have been how they did some of that. Probably on 4 track too. I love those two pieces now. That they are up there with Faust for avant garde, makes me pleased. Plus I know people have used them in their productions. Ok back to the treasure trove. More ‘untitled’ pieces that have you wondering what did that? I’m listening to something that is not far from the modern, electro-acoustic people. They have college courses to learn how to do stuff like this noise now. Birmingham University, Beast sound system all of that. We are on the deep drone voice that sounds like Heinkels overhead. See how quickly this is moving? That was about 25 seconds before more old school piano, acoustic and well recorded, yet sounding like you and your friend sitting beside each other having a jam. The piece that’s on right after that is awesome. It could almost be Cabaret Voltaire or Einsturzende Neubaten. A flanging electronic loop going round with what sounds like cars going by. It doubles, collapses and fades and a really strong jazz flugelhorn plays over pure chill out. It’s gorgeous. Distorting and clean at the same time, the drums minimal and it used to sound so great at night. Sounds good now. Then comes another of those riffs that fit because they are there. Plop! back into all the saucepans in the kitchen and echo.Tape is being hand manipulated into the echo. So lots of dubby rewinds and reverb shots. Scratchy guitar leads into another of their simplistic almost pop hit numbers. The lyrics are odd and the voices earnest singing them. Its inviting and nothing goes on too long. We get Der Baum next. I have never forgotten this one. Sounds like everybody is singing a different song at once. It’s pure Pere Ubu. It begins to build and some of the German voices begin to get uppity. Just one riff going round. Who needs verse chorus right? All the voices sound cool and German. The effects are Dr Who proper. Which leaves us with one last work of art. Track 26! 50p!! A perfect fall asleep last track. I say that because in the late night I could listen without parental disturbance. I would drop off. A voice would come in loud wake me slightly but I know the arm will rest I have no need to move. Drift..into pretty acoustic guitar and French conversation. So, The Faust Tapes, an introduction to the European alternative and the German experimental scene that had so much to offer. As a Dr. Who kid it had a direct connection to the techniques of reversing and science fiction echo. it also had rock and roll, electronic sound and an atmosphere so strong you would only listen when the time was right. Listening through to write, even though I’ve not got the vinyl out its on youtube, it sounds fresh and unscratched. Ok, mp3 I know, but I used to listen to this on a dusty needle on a mono Fergusson player as a kid so it sounds pretty new! Mind you music sounded great on that box. There was plenty of bass with the lid down. I didn’t see it as hippy either. I had no idea what they looked like. Kraftwerk perhaps? I admit I’ve always wanted to do a kind of cut up like The Faust Tapes myself. However, believe it or not, I had a job for a few years as a ‘think tank’ for a music company Boosey and Hawkes, I had to come up with the odd. Sadly a new manager came in who didn’t get odd at all. So after about 5 years of releases it ended. In a way though the job was my chance to avant grade and i definitely leapt into the pool. I made tracks of all descriptions. Dripping water in a drain I found in a wood, that when finished sounded like polar ice cracking, I used environmental sounds and made them unrecognisable and worked to give a distinct visual image, or unplayed playable instruments. I can safely say Faust opened the door for me, made it possible for me to think the unthinkable and steer creativity into the dark and find shape. Search for the timeless. I went to see Faust not that long ago. 3 or 4 years ago. It was really good, they did play a song from the Faust tapes.